Walk­ing home through the streets of Almaty as a young girl, I remem­ber see­ing a girl with the most beau­ti­ful hairdo pass by. As was the style in the early 2000s, her head was covered in dozens of but­ter­fly clips. It also fol­lowed an intric­ate cir­cu­lar pat­tern, and every clip on her head was a col­our of the rain­bow. My young and impres­sion­able mind was so fas­cin­ated by what appeared to me as bold and eleg­ant fash­ion state­ment that I instantly star­ted to plan a craft pro­ject of my own. The minute my mom unlocked the door I ran off into my bed­room and star­ted con­struct­ing my mas­ter­piece. I wanted it to be even bet­ter than the hair­style I saw on the street, so I decided to grab all the elast­ic bands, hairclips, head­bands, scrunches and but­ter­fly clips that I could find — and arrange them intric­ately in my hair. To com­ple­ment the look I put on my puf­fi­est, pinkest and snar­ki­est ball gown and a feath­er boa. With a proud pos­ture and my head held high, I des­cen­ded into the kit­chen to show­case my magic­al cre­ation to my par­ents. 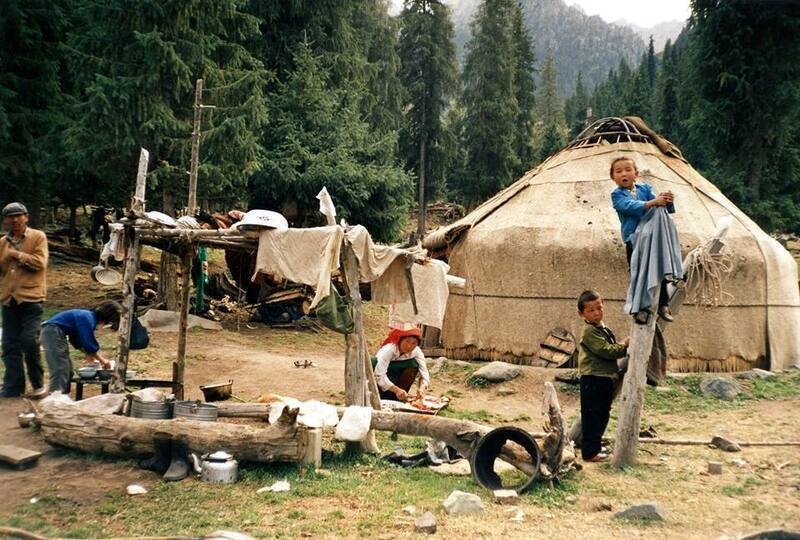 Nowadays, calling a person from a village Mambetka is one of the many ways that urbanites reaffirm superiority over rural Kazakhs. “Sweetie, you look like a mam­betka” my mom chuckled the minute I appeared in the doorframe. I slowly real­ised that my mom didn’t really dig with my avant-garde fash­ion choices, yet mam­betka part of the feed­back con­fused me, I wasn’t really sure what it meant. Although gentle, her mock­ery brought tears into my eyes as I tried to defend my beloved cre­ation. After all, what should I feel guilty about? The vis­ion of an angel-like fig­ure on the street with but­ter­fly clips in her hair passed through my mind once again… My pos­ture slowly regained its con­fid­ence. Calmly, as though I knew a secret about life my mom was yet to dis­cov­er, I deftly tilted my head and said, “Mama, mam­betka bolay­in­shi” — “Mom, let me be a mam­betka”. Years later I uncovered the reas­on this story from my early child­hood became a go-to anec­dote in the fam­ily gath­er­ings. You see, mam­betka, or a mam­bet for males, was (and still is) a slur that so many of the soph­ist­ic­ated city gals and guys call people from the vil­lage. The term became pop­u­lar dur­ing the Soviet rule and was enforced by the gov­ern­ment as a way to segreg­ate Kaza­khs to edu­cated and uneducated groups. Nowadays, call­ing a per­son from a vil­lage Mam­betka is one of the many ways that urb­an­ites reaf­firm superi­or­ity over rur­al Kaza­khs claim­ing that so many of the so-called mam­bets don’t have the “city smarts”. But some vil­la­gers come to the city and dis­cov­er an immense vari­ety of products mod­ern cap­it­al­ism provides, it becomes an over­whelm­ing exper­i­ence; speak­ing Kaza­kh on the daily makes it their actu­al moth­er tongue, unlike the urb­an major­ity, for whom Rus­si­an is their lin­gua franca. Grow­ing up in the Kaza­kh steps, caring for the cattle, rid­ing horses and cher­ish­ing tra­di­tion – they seem out of place in the stone-cold con­crete jungles of the city. Hence, mam­bet in Kaza­kh soci­ety is syn­onym­ous with “bad taste”, “bad lan­guage”, and “bad man­ners”. No won­der that the play­ful accept­ance of the mam­bet status com­ing from the Almaty’s finest seemed to be so…. funny. No one in their sane mind would choose a status of mam­bet by their own free will because it almost guar­an­tees job dis­crim­in­a­tion and a con­stant state of neg­li­gence in the hier­arch­al sys­tem of Kaza­kh­stan. Yet, we – the alleged intel­li­gent­sia – uni­formly ignore that none of the mam­bets chose their status of eco­nom­ic and social dis­ad­vant­age; rather, they were born into it. So what if my curious five-year-old mind unknowingly discovered a secret? Imagine living in a world, where instead of dividing ourselves and reaffirming superiority over mambets, we would actively choose to work together. This pat­tern can be observed dir­ectly; from unequal dis­tri­bu­tions of school fund­ing across regions — to high­er poverty rates in rur­al regions when com­pared to urb­an ones. In fact, this poverty gap is so pre­val­ent that accord­ing to an IMF report, the share of people with an income below the sub­sist­ence min­im­um in 2014 var­ied from 1.7% in Astana, the country’s cap­it­al, to over 10% in south Kaza­kh­stan, a pre­dom­in­antly agri­cul­tur­al region. As I dive deep­er into my research I uncov­er that this hos­tile beha­viour towards rur­al pop­u­la­tions is not unique to Kaza­kh­stan. On its East­ern bor­der lays a coun­try, wherein Hukou, a house­hold regis­tra­tion sys­tem, law­fully restricts access to each city’s edu­ca­tion­al and health­care sys­tem if an indi­vidu­al hap­pens to have been born in a rur­al area. For China’s eco­nomy these migrants are essen­tial as they account for half of urb­an work­force and cre­ate half of country’s GDP; yet, they are the most mar­gin­al­ised and vul­ner­able group of the pop­u­la­tion. Mean­while, India has adop­ted the most recent addi­tion to its post-colo­ni­al caste sys­tem based on lin­guist­ic dis­crim­in­a­tion; uni­ver­sit­ies, gov­ern­ment jobs and cor­por­ate sec­tor all require flu­ency in Eng­lish, yet only the rul­ing elite and middle class can afford to send their chil­dren to private Eng­lish schools. ‘Divide and con­quer’ they say — and it seems as if the elites of the world are employ­ing this tech­nique to cre­ate arti­fi­cial priv­ileges. The go-to mam­betka bolay­in­shi anec­dote seems innoc­u­ous at first, yet its mean­ing in a broad­er con­text of mar­gin­al­iz­a­tion has far-reach­ing implic­a­tions. So what if my curi­ous five-year-old mind unknow­ingly dis­covered a secret? Ima­gine liv­ing in a world, where instead of divid­ing ourselves and reaf­firm­ing superi­or­ity over mam­bets, we would act­ively choose to work togeth­er to ensure that no one has to suf­fer from the eco­nom­ic dis­ad­vant­ages that lie behind “bad man­ners” or gar­ish hair-clips.